, (Reuters) - Advanced Micro Devices Inc (AMD.O) shares have been the S&P 500’s rock star gainer this year, but a recent slide signals some investors are hedging their bets that it can make major inroads in the server computer chip market dominated by Intel Corp (INTC.O). On Tuesday, AMD was the top decliner and Intel the top gainer on the S&P 500. The company has a steep hill to climb to live up to the hopes that had pushed its shares up as much as 228 percent last month from last year's close, the biggest percentage gain of any S&P 500 company. AMD fell more than 7 percent on Tuesday and is now down almost 15 percent from the 2018 high hit in mid-September. Before Tuesday, the company was trading at 51 times expected earnings for the year-ahead, a valuation that left some analysts skeptical about the potential for more gains. Eleven analysts recommend buying AMD's stock, while four advise selling and 16 have neutral ratings, according to data from Refinitiv. After ending 2017 at just $10.38, AMD shares last month reached $34.14, their highest since May 2006. That was impressive for a company that in 2015 some analysts viewed as a bankruptcy risk due to falling demand for personal computers. A 5 percent drop in the chipmaker's shares on Friday hinted at how vulnerable the stock may be. Investors have been betting that AMD can win over new clients with competitive chip offerings while arch-rival Intel wrestles with supply problems and delays in developing its next-generation chip manufacturing process. 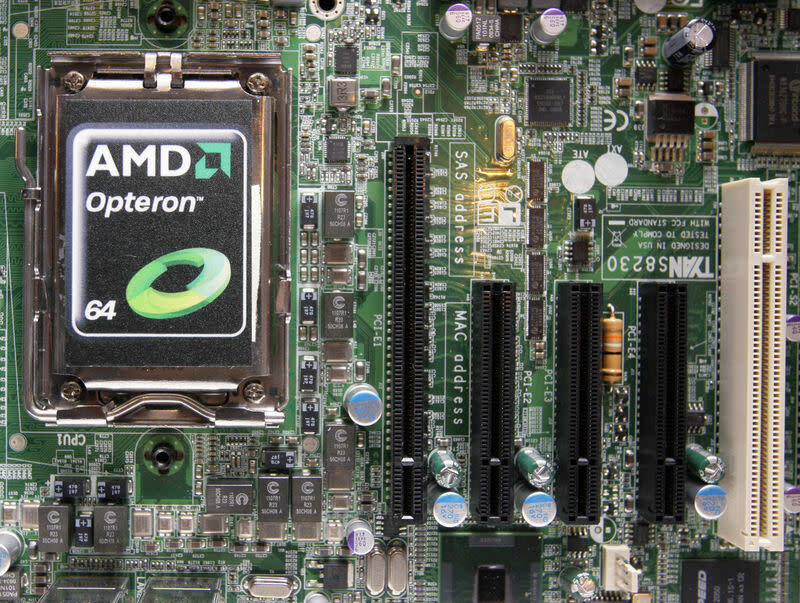 AMD has a lot of room to expand its low single-digit percentage share of the server market. But some analysts say it will take longer than investors realize to build share in the server market. "We'd agree with AMD bulls that it's done a much better job of executing on its product road map but executing on products and gaining market share are different things," said Ruben Roy, analyst for MKM Partners, which has a "hold" rating on AMD stock and a $20 price target. "With valuations reflecting the best possible scenario, we think that there could be better opportunities coming up if there are hiccups," said Roy. He sees AMD increasing its share of the server market to about 8 percent from in 2019 from 3 percent. AMD has said it expects to end 2018 with mid-single digit server market share and to be on a path toward a double-digit share. Wall Street analysts expect earnings per share of 47 cents for 2018 and 67 cents for 2019 on revenue growth of 25.7 percent in 2018 and 9.6 percent in 2019 according to Refinitiv. Bernstein analyst Stacy Rasgon, who rates AMD "hold" and has a $16 price target on the stock, says its growth so far has been too dependent on its graphics chips, which face stiff competition from rival Nvidia (NVDA.O). On top of delays to its 10 nanometer manufacturing technology, which would allow it to make smaller chips, Intel has suffered from leadership uncertainty as it seeks a new chief executive after Brian Krzanich resigned in June. "To their credit, AMD has taken total control of the narrative from Intel. Maybe they did too good a job," said Rasgon.